Join a ranger at Indiana Dunes National Lakeshore for a hike to the top of Mount Baldy from 10-11:30 a.m. Sunday beginning at the parking lot, 101 Rice St., Michigan City. No reservations are required. The Mount Baldy parking lot and beach are now open everyday from 6 a.m. to 11 p.m. after being closed for the last four years. 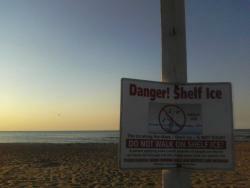 The dune itself, however, is still closed for general public use for reasons of public safety and restoration efforts. More information is at 219-395-1882 or www.nps.gov/Indu.